Auxerre, France. For many years, I was lucky enough to live for part of the year in Burgundy, where wine is not just a beverage, but a way of life. To cook with wine is as natural as adding salt and pepper, and much more fun. Our nearest vineyards, the Auxerrois, just 30 miles away produced light, fruity red Pinot Noirs and grassy Sauvignon Blancs, both ideal for summer cooking. 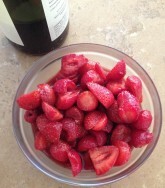 Our ritual would begin with the first strawberries, pink and perfumed from the sun. I macerated them in red wine with a bit of sugar, hulled and left whole or cut in chunks. After an hour or two, a luscious syrup forms, making the strawberries perfect for serving over ice cream or a slice of sponge cake. The same treatment is also beneficial with pitted and sliced peaches — I rarely peel them for lack of time. When peaches in red wine are sprinkled with crushed macaroons or amaretti cookies, the dessert is so delicious that it earns its own name – chicolle. Let me say loud and clear that an expensive vintage is not needed for cooking. Quite simply, if a wine is good to drink, it is good for cooking too. You’ll find that the basic characteristics of the wine, fruit, acidity, or sweetness, will come through in the cooking. I often carry this further and serve the same wine at the table as I have used for cooking – that way, there’s no leftover wine to deal with. Another summer habit of mine is to substitute wine for the vinegar in vinaigrette dressing. The wine may be red or white, depending on your taste and the main ingredient of the salad, and sometimes I boil it to reduce by about half and concentrate the flavor. Either way, I whisk in salt, pepper and then olive or nut oil in the classic proportions of one of wine to three of oil. The resulting dressing is light and refreshing on lettuce, and vegetables such as cooked green beans and zucchini. Be generous in adding chopped fresh herbs as the mildness of the wine enhances their flavor. Wine, of course, is a key ingredient in quick marinades. Dip sliced vegetables such as eggplant, peppers, zucchini and squash of any kind in this same wine vinaigrette, leave them to soften 15 minutes or so and you’re ready to put them on the grill. Fish, poultry, and meats are all improved by marinating in wine, neat this time, with a few aromatics such as chopped basil, thyme, or oregano, chopped garlic or shallot, or grated fresh ginger, and cracked pepper. No pan-seared meats and poultry should be without their little wine reduction sauce, basically an unthickened gravy. Simply take the meat or poultry from the pan when it is cooked, pour off all but a tablespoon of fat and add a half cup or more of red or white wine. Boil it, stirring to dissolve the pan drippings (wine is an excellent solvant of those delicious caramelized juices) and reduce the mixture almost to a sticky glaze. Add a few tablespoons of stock, cream, even milk, and pour the sauce over your meat after tasting and adjusting the seasoning. As an example, for a quick supper, I butterfly a boneless, skinless chicken breast and with a rolling pin pound it flat between two bits of plastic wrap. After coating the chicken with flour, salt and pepper, I sauté it in butter until brown, 2-3 minutes on each side, and then make the wine sauce as above. Add some pasta or sautéed zucchini and you’re ready for the table. Finally I must share with you my local Burgundian discovery – chateaux, a deliciously foamy light dessert made by beating eggs and sugar, then whisking in boiling white wine. When first I heard about it, I was sceptical. Surely the custard would curdle with the hot wine, or separate like sabayon? But no, Chateaux can even be simmered without curdling, though I would not advocate a rolling boil. What is more, it holds the same impeccable consistency for eight hours or more. It’s my favorite foolproof recipe. Please try it! Chateaux or satou is Romanian, a wine custard that can be served plain in stemmed glasses, or poured over fresh fruits like berries, peaches, figs, and the first pears of fall. The choice of wine here is wide open: with a relatively dry Sauvignon Blanc, the dessert will be light and fresh, or with a sweet Muscat or Sauternes the effect is richer, ideal for tart fruit. I’ve even made Chateaux with a Beaujolais-type red wine, when it turns a pretty pink. 1. Beat egg yolks, sugar and orange or lemon zest in an electric mixer at high speed for at least 5 minutes until light and very thick – the beating also helps develop citrus flavor. Meanwhile bring wine just to a boil in a heavy-based pan.